David Tennant voices the character Fugitoid in 13 episodes of Season Four of Teenage Mutant Ninja Turtles which airs on Nickelodeon. His character also appeared briefly in the final episode (Annihilation: Earth! Part Two) of Season Three. Fugitoid was formally known as SAL. 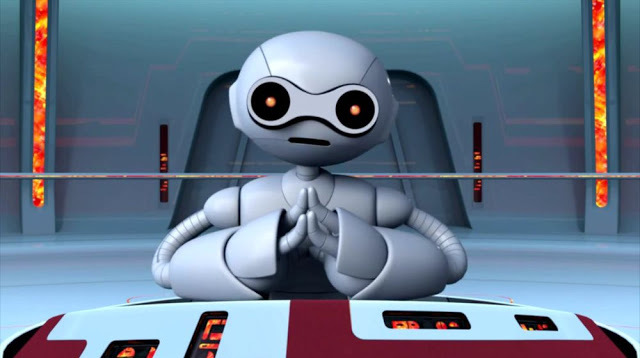 The Fugitoid is a fugitive android, a pre-TMNT Mirage Studios character who later became integrated into their universe and befriended the turtles. He was initially Professor Honeycutt, a scientist from another world whose mind became trapped in his android creation SAL. The first twelve episodes of Teenage Mutant Ninja Turtles Series Four will be released on DVD in the UK on Monday 10th October. A new episode of Teenage Mutant Ninja Turtles premières today in the US.